I would like to turn on my Hue light when I press the pause or stop button on my remote while I watch a movie. I don't think this is possible at the moment with NEEO alone. But if you own a home automation system this is an easy task. I personally use IP-Symcon for this scenario. Because the NEEO remote sends via forward actions every single command to an external system of choice you can then react with the external system to the Play and Stop Trigger and switch every light system that can be controlled by the external system. This can be Hue or any other system like KNX, LNC, Homematic, Z-Wave, EnOcean etc. In case of IP-Symcon, you would use IPSymconNEEO to react to the Play and Stop and SymconHue to dim the Hue with transition time to the desired scenario. Because it makes no sense to always turn on the light, this must depend on conditions. But that is currently not configurable with NEEO alone. In an external tool, this is possible. You can react to the messages send by NEEO. Here the time of day would be considered because you do not want to switch on the light during the day. So in my case, there are two mini scripts responsible for turn on the light and turn off the light. So you are reacting in case something is changing. Then you compare if the values from NEEO match your pattern with =. Furthermore, it should be checked whether it is day or night so that the light is only switched on if necessary. If you press then your play button light is in the night turned off, if you press the pause button light is turned on again. Puh, if so I can switch straight to Control4. Nils Jacob That depends on where you live. Control4 is widespread in the USA in German language areas or Europe is more widespread by the professional systems IP-Symcon. IP Symcon comes at least in the purchase significantly cheaper than Control 4 and thus is also much more possible if you compare this directly with Control4. Control4 is also installed only by an Integrator, IP-Symcon can be installed by an Integrator in complex scenarios, but you can do this simple task by yourself without the need for an extra expert order. You can try this by yourself with a demo if you like, I think this simple scenario takes only about 15 minutes after installation to work. Anyway, we understand that there is a need for more customization for the hard buttons. There is already a very high requested voting for this over here. I'm sure this feature will come in future firmware releases. Stay tuned! Ingrid if I understood him correctly he just wants to press the button for play or pause and then depending on the time of day automatically turn a lamp (Hue) on or off, without further shortcuts, just dependent on the keystroke. Fonzo exactly, I would call this multi action assignment, one trigger - two or more action paths. Of course with IF ELSE. still NEEO doesnt get it - "At the moment you can add all these shortcuts to your Touchscreen. In that way, you can turn on/off your Hue lights, while you are watching TV. Personally, I like this way very much, as all hard buttons on my Remote are used for the intended functions Play, Pause,..." - answers like this make me shiver and not due to the fact that its getting cold outside, Marketing or simply lack of understanding. Where is the disconnect ?!?!? Daniel Sütel The statements are at least contradictory by NEEO. On the one hand, NEEO itself has no backlight of the buttons and it is said that this is not necessary because you can use everything with the buttons that you can feel. On the other hand, you should then create any shortcuts just to turn off something, then I have to look again at the remote. As long as there is no possibility to work with IF and ELSE at NEEO itself, this can not be easily done without additional external solutions. The purpose of a universal remote is to simplify processes and perform them with just one or a few keystrokes or to do something automatically depending on conditions. If I have to constantly look at the display for something to use, the whole advantage from the remote with the haptic feedback is gone. If you have to operate everything on the display you can ultimately use an app that can do more, is individually customizable from the surface and I also have to look every time on the display to switch something. The big advantage and the only difference between a NEEO and an app are the hardware buttons. If you can not combine actions and set conditions to the Hardware button with IF and ELSE the actual advantage of such a remote with buttons is gone. Daniel Sütel You got the idea! of putting multiple action on one "button" with conditions would do the job perfectly. NEEO should always keep in mind that also non tech people using the remote. And lately I'm struggling to keep my girl convinced. No I'm not talking about the hard buttons, I would just like to have the possibility when I press pause on my OPPO or Apple TV to turn on the light in the evening without messing with the remote. Fonzo I just have my living room and want to control all AV stuff with my remote nothing else but so far Control4 is the only solution that does what i want without messing with two or more systems. Nils Jacob Well, Control4 has its own remote controls but as I said that is not cheap only for use in one room completely oversized. 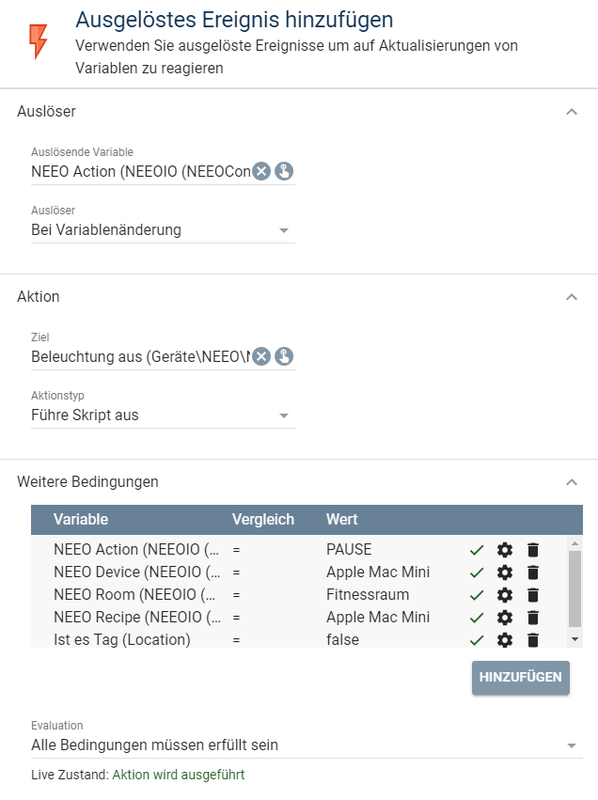 After recently the NEEO Remote Pro has been announced maybe this can do more but it has no use for you because you already own an NEEO Remote. To come back to your question, yes it will perhaps be possible if NEEO itself adjusts the firmware and should provide such a feature in the future. If you want to solve this at the moment with the existing firmware and the existing NEEO, however, this is only possible with the help of an external system that provides you with the logic that you need in this case.